Migrating the Exchange mailboxes from one forest to another requires a lot of preparations using the native methods, and sometimes they can be baffling. Kernel Migrator for Exchange helps you to eliminate those complications with easy and straightforward approach for migrating from one version of Exchange to another effortlessly across different domains and forests. The solution lets you to create a two-way trust between two different AD forests before performing the migration. Software allows migrating everything from the source platform - including user mailboxes (along with its properties), Outlook rules, Global Address List (GAL), archive folders and everything else, as it is to the destination platform. The solution lets you to migrate from one Exchange/Office 365 domain to another domain or forest, conveniently. You can migrate to/from Exchange 2000 to Exchange 2003, 2007, 2010, 2013, 2016, 2019 directly. Export your Exchange/Office 365 public folders between two different domains and AD forests. It doesn’t matter how big is the size of your public folder, the solution keeps it simple during the entire process. The solution not only migrates user mailboxes and public folders, but it also allows the migration of mailbox rights, mail delivery restrictions, permissions, and everything else with total precision from source to destination platform. To ensure zero impact on the end-user, Kernel Migrator for Exchange allows you to fully synchronize your mailboxes in these manner – source to target, and target to source. The solution provides true co-existence to ensure that every updated item (contacts, invitation, schedules) is reflected on the server throughout the migration process. You don’t have to manually run a check at your project status, each time; simply enable real-time alerts function to keep you updated with entire progress of the project straight to your preferred Inbox or via the software console. These notifications are helpful to track your job status. Can I perform cross forest migration from Exchange 2007 to Exchange 2016? Yes, you can. The solution allows you to migrate your user mailboxes, public folders, archive mailboxes, Outlook permissions, rules and everything else from Exchange 2007 (and other versions) to Exchange 2016. How to migrate Exchange mailboxes to different domain Exchange Server? Select your desired source forest Exchange Server and then add your destination exchange platform using Different Domain option, to migrate all your mailboxes to another domain server. The solution allows to build an AD trust and sync between the two forests, to provide a seamless migration outcome, and avoid dual work of moving mailboxes. Can I move Office 365 mailbox to another Office 365 environment? Yes, you can. Kernel migrator for Exchange allows direct cross forest Exchange migration from one Exchange organization to another. Does Kernel Migrator for Exchange tool export mailbox rules and permissions in cross-forest migration? Yes, it does. 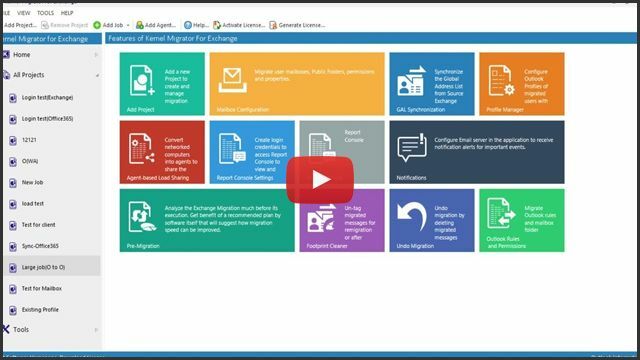 The solution not only helps to migrate your user mailboxes, but it allows complete data migration from source to destination including Mailbox properties, Outlook rules, Outlook profile updates, archive mailbox migration, Mailbox permissions and rest. Does your tool delete/modify anything from the source server? No, it does not. Kernel Migrator for Exchange tool uses the source information passively, which means neither your data or its integrity is deleted or modified at any point from the source server. In what order, should I perform a cross-forest migration using Kernel Migrator for Exchange? Use “Agent Configuration” to add the agents for sharing the migration load. Use “Mailbox Configuration” function to migrate the properties, limits, and permissions of mailboxes. Now add a Mailbox Migration Job in the Project to migrate user mailboxes. Use “Outlook Rules and Permissions” to Outlook rules and permissions from Source to Destination. Can I migrate specific items to Office 365 platform? Yes, you can. The Office 365 migration solution is integrated with smart filter option that allows to filter data items based on Message Class, date range, folders (to include/exclude) and other criteria.